American Animals marks documentary filmmaker Bart Layton's break into feature film. Well, sort of. Since the film is based on the true story of a library heist that happened at the Transylvania University in Lexington, Kentucky in 2004, Layton interestingly peppers his fictionalized depiction with interviews with the men who actually committed the crime. The result is a different kind of heist film, one that makes a case for sympathy for individuals that, depending on your reading, aren't worthy of redemption. The film opens strong out the gate with a primal score by Anne Nikitin and some interesting juxtaposition between paintings of birds of prey against the sharp, bird-like features of our central protagonists Spencer (Barry Keoghan) and Warren (Evan Peters), which Layton strikingly accentuates. However, from the impact of the opening onward, the film takes on the form of a balloon slowly leaking air, delaying the inevitable husk that it really seems to be. The film is not without its highs and lows or the occasional enjoyable scene, and Layton's decision to include interviews with the young men who committed this crime are largely part of that. They uplift the story ever so slightly and provide a direct gateway into these character's heads, adding to the comedic and emotional beats, but that, too, becomes a bothersome load that weighs the film down eventually. The cinematography from Ole Bratt Birkeland draws out the vibrancy of the colors, but also has tendency to fall flat at times. Layton's direction involves a lot of camera movement that culminate into some interesting moments, but also call more attention to themself and, in turn, loosing some effectiveness and punch. Not to mention that the film is essentially a less powerful mashing of I, Tonya, 15:17 to Paris, and Bonnie and Clyde. While the ping pong between the fictionalization and the interviews give select scenes and moments some much needed vitality, it also fails to establish an adequate pace and flow. More often than not, it's a pull in the wrong direction that yanks the cord on any potential impact. This may be in part due to the fact that the film has three editors (Nick Fenton, Chris Gill, and Julian Hart), who seem to have slightly different visions that don't exactly gel. Far and away the worst aspect of the film is its limitless sympathy that it dolls out to its protagonists, who basically decide to rip off some rare books and brutally beat a librarian because they're bored. The film would've been far more poignant as a conversation piece that serves as a cautionary tale of any idiot considering taking on a life of crime, as opposed to a flimsy sympathy piece for characters who didn't even successfully commit their crime and are unworthy, in my opinion, of filmic redemption or sympathy. In the case of American Animals, these young men are just bored, and that's no justification. Even Udo Kier and Ann Dowd, both of whom are quite wonderful in their small roles, couldn't save this film from its skewed morality. That said, it's still capable of being an entertaining watch, and maybe even an enjoyable one depending on how much you choose to shut your brain off. However, suffice it to say, there are better stories to tell and far greater films out there that are more deserving of our time and money. Take a pass on this one, like this individuals should've done with their "heist." Rating: 2.5 rare and valuable books outta 5. What do you think? 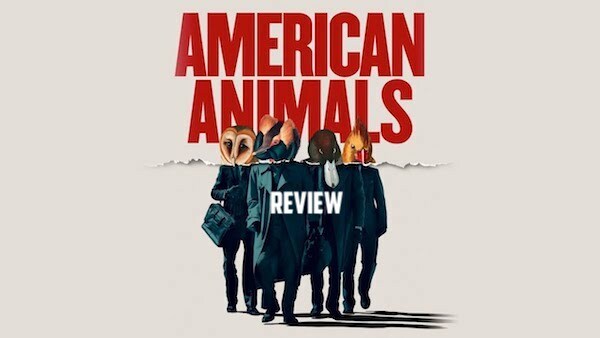 Did American Animals work for you? Are these men deserving of redemption and sympathy? We want to know. Share your thoughts and feelings in the comments section below, and as always, remember to viddy well!